Maurice Béjart’s legacy is immense, for his audience, for his dancers, for choreographers, who after him created their works and especially for me. I felt the urge to pay a small tribute to him, and to consider and evaluate what Maurice Béjart has left me. The Vitality – The very first and strongest element was for me the energy. Béjart saw and felt dance as vital impulse, an explosion of joy. It is amazing, that this affirmation might seem to be too simple, but yet so few other choreographers understand that. The Primordial – As an intellectual and a philosopher Béjart also understood this vital energy as primordial and not in need to be elaborated and conceptualized. Instead it requires room to expand to its full potential. The Sacred – Béjart´s credo was also that dance is a spiritual art, not in the sense of a ritual ceremony, but by recognizing God in a human dancing. The sacrality of the action of dancing does not even evolve from the dancer himself, but from the divine within him invested by God. In the ancient Mauritanian Muslim tradition it was customary to exclaim “Allah!” – the origin of Spanish “olé!” – when a dancer performed at the highest levels of beauty, abandon and intensity. For those moments dancers were believed to be vessels through which Allah was acting, the witnesses felt the performer being touched by the divine. The Gesture – the human gesture is not just a word in a dance vocabulary, but a sign of the inexplicable that opens horizons. Béjart was not searching for embellishment or technique in dance, but for the essential meaning of the gesture. Inspired by Hinduism and Buddhism where these gestures were mostly practiced by hands came the Sanskrit word “Mudra” giving the name for his school. Gil Roman is performing the principal part in SWAN SONG and embodies three roles. He dances the piece as interpreter performing the choreographic concept, he represents myself as a biographical filter and finally, he is appearing as himself, Maurice Béjart´s muse, leader of the company that carries Béjart´s name, responsible for its heritage through the historical work and new creations. The Swan Song is commonly used to describe a final performance given just before death or retirement. But I don’t see it as such. On the contrary! As Maurice Béjart declared himself “Every creator takes someone else´s creation to get inspired, to destroy it and to create something new”. My SWAN SONG is intended as a sketch of his artistic heritage. An attempt to outline, how his wonderful teaching could know new life through new work of future generations of the XXième Siècle, sons of Maurice Béjart. 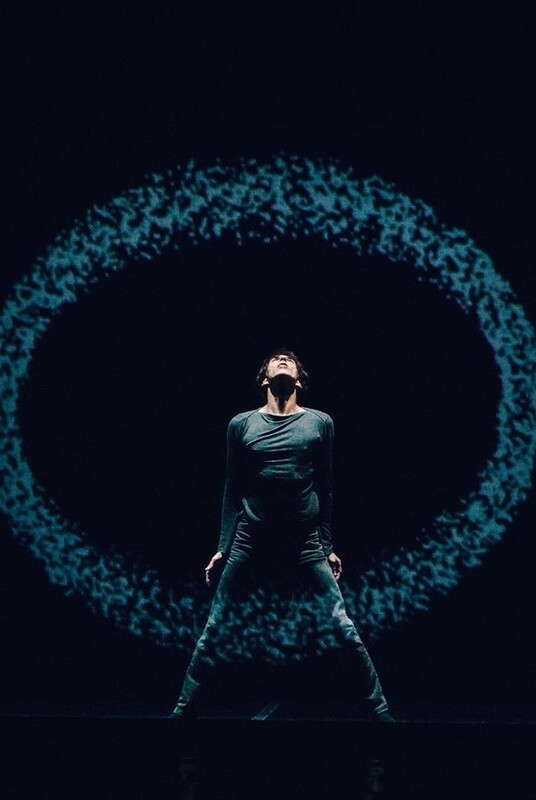 “Much more than being just himself: at the same time the interpreter, the guardian of the Béjart´s DNA, a creator – three roles in one for this SWAN SONG chanting the dynamics of life – [Gil Roman] suspended the time for a rare moment of divine grace. Originally, therefore, there is Giorgio Madia’s desire to evoke the man he considers a master. […] A voice fractures the night, ponderous but cheerful. Yes, it’s the timbre of Maurice Béjart, this artist who knew how to tell his legend. He speaks about the creator’s work, about the act of taking from the creations of others, destroying, transforming them. SWAN SONG is a story of legacy, an invitation to freely enjoying it. Seeing the dance of Gil Roman, his page’s elegance, the gem of his melancholy trickling in every gesture, his life parading in pirouettes – along with our memories – his umbrageous fluidity, his fingers magically tracing a white cloud on the veil – an overlay – then a circle that looks like vaudeville – as if in this limelight Charlie Chaplin would enter. Suddenly it’s a star field unfolding, and the dancer is in the middle.